A man dressed as Saint Patrick waves to spectators during the 2010 Sydney St. Patrick's Day Parade. 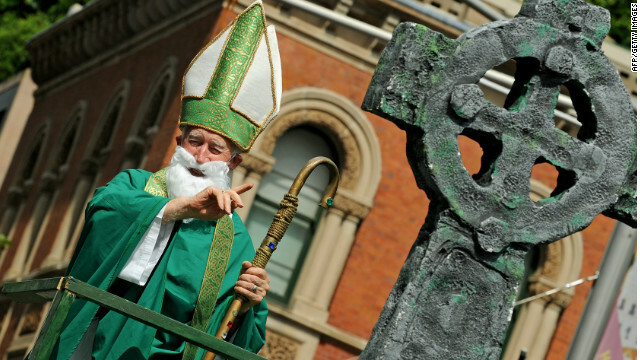 Was Saint Patrick a slave-trading tax collector? (CNN) - While Saint Patrick's Day has long been the preserve of Guinness-drinking revellers painting the world's towns green while wearing shamrock hats, Irish Catholics have always taken pride in their nation's patron saint. Now a new study from Cambridge University based on his writings suggests Saint Patrick was not brought to Ireland as a slave, as the legend has it, but that in fact he may actually have sold slaves his family owned to pay his way to Ireland - in order to avoid a job as a tax collector for the Roman empire. The findings fly in the face of the classic account of the life of Saint Patrick, who grew up as a member of the Roman nobility in western Britain and was supposedly abducted and forced into slavery in Ireland around 400 A.D. According to this history, Patrick escaped and became a priest before having a vision and returning to Ireland to convert the Irish to Christianity.